GRILL DIRECTIONS: Heat grill. In small bowl, combine 1 tablespoon cherry juice blend and cornstarch; blend well. Set aside. In medium saucepan, combine rhubarb and 1 cup cherry juice blend. Bring to a boil. Reduce heat; cover and simmer about 8 minutes or until rhubarb is very tender. Strain rhubarb; discard pulp, reserving juice. Return juice to saucepan; add cherries. Bring to a boil. Reduce heat; cover and simmer 10 minutes or until slightly thickened. Stir in cornstarch mixture. Bring to a boil. Cook 1 minute or until thickened and bubbly, stirring constantly. To serve, bring remaining sauce to a boil. Serve sauce over pork. To broil, place pork tenderloins on broiler pan; broil 4 to 6 inches from heat using times above as a guide. 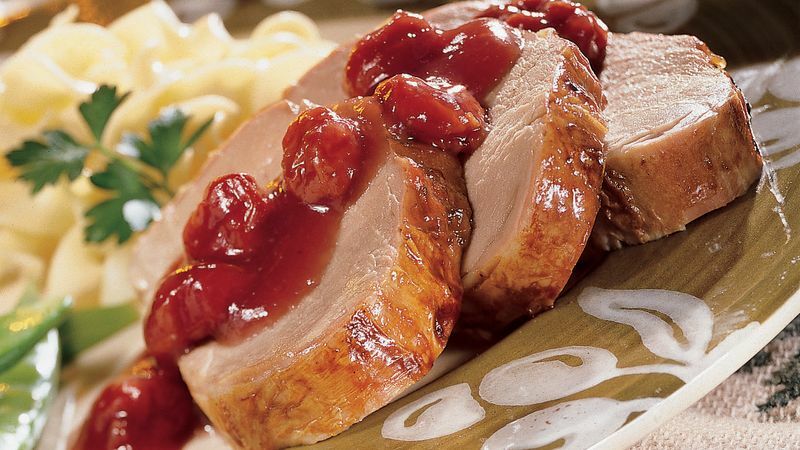 Cooked to a doneness of 150 to 160°F., pork tenderloin is still light pink in the center. Not only is pork perfectly safe to eat at that doneness, it’s wonderfully tender and juicy. Dried cherries may be found in the baking or snack sections of the grocery store. They are often also found in the bulk bins. One-half cup of fresh or thawed frozen tart cherries may be used in place of the dried cherries.